As with all Antarctic trips the first few days on the continent have been a whirlwind of activity. 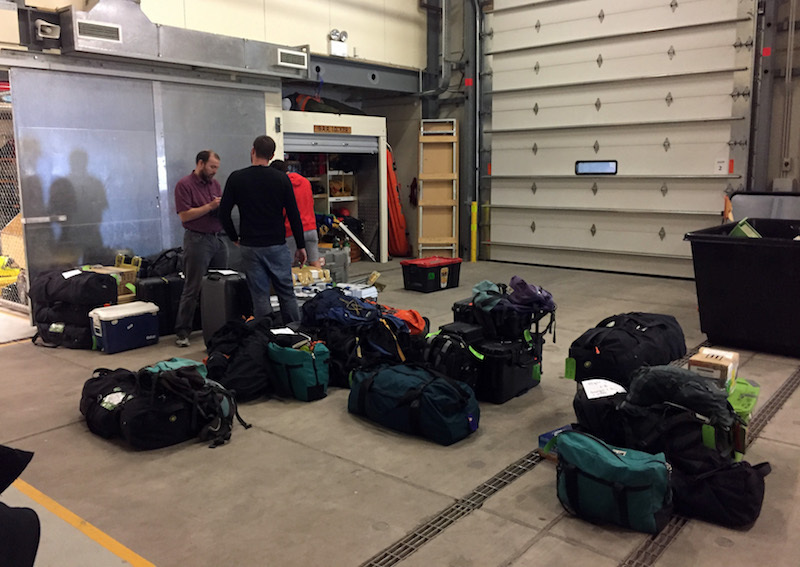 I’ve been busy with meetings, training classes, and briefings as well as getting my science cargo ready to be deployed to our field camp. I’m scheduled to fly on a helicopter later today to the Lake Vanda field camp in the Wright Valley. This will be an approximately 45 minute flight from Ross Island, across McMurdo Sound, and then into the Wright Valley in the Transantarctic Mountains. The field camp I’ll be at will be home to 12 people on the larger project I’m working on. There is a hut at the camp that will serve as our science building and we will all sleep in tents. 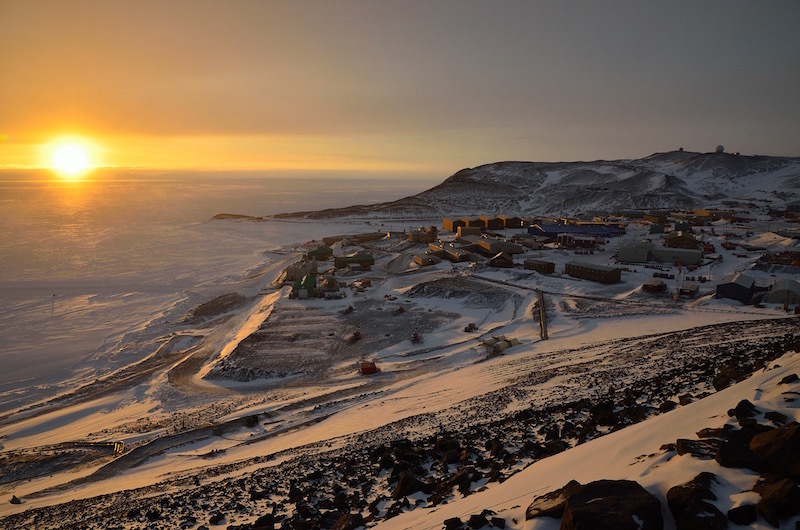 I’ll be at this field camp for the next 10 to 14 days and will have no internet access and will only be able to contact the outside world via satellite phone, so this will be my last blog post until I get back to Scott Base towards the end of the month. Before I leave for the camp I wanted to describe what life, at least what I’ve seen of it in the past few days, is like at Scott Base and compare it with my previous experiences at McMurdo Station. Welcome to Scott Base. 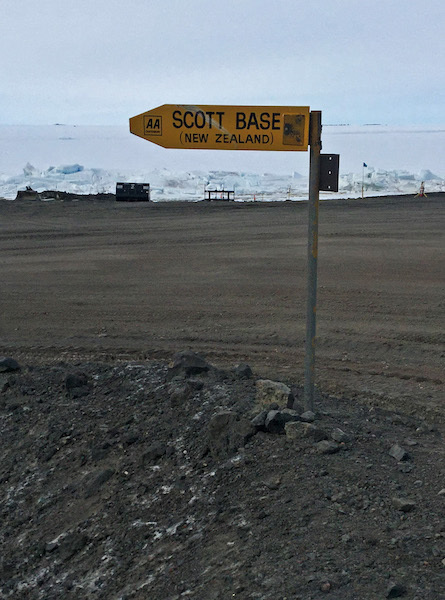 The Scott Base sign on the road from the snow and ice runways to McMurdo Station. The biggest difference between Scott Base and McMurdo Station, the main United States Antarctic program base, is size. Right now there are around 70 people on station at Scott Base, and this is close to the base capacity. In contrast there are over 1000 people on station in McMurdo, and this is a pretty typical summer base population. The smaller base population makes it much easier to know and recognize all of the other people you see in your day to day activities creating a tighter sense of community here. Scott Base as seen from the road leading to McMurdo Station. McMurdo Station from Ob Hill. As you can see in the two photos above Scott Base is relatively compact with a small footprint while McMurdo is a large, sprawling base. McMurdo Station is spread across a large number of buildings while Scott Base is largely one interconnected series of buildings. 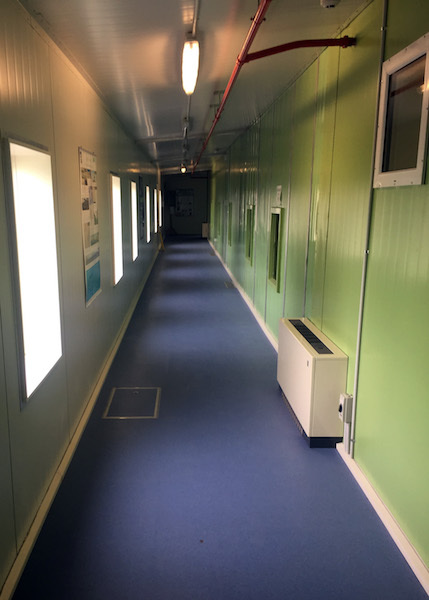 Having all of the base buildings connected with an enclosed walkway is a real advantage in the Antarctic as it allows you to stay inside when the weather is bad, which is especially nice during the long winters. In McMurdo you need to go outside to go from your dorm room to eat at the galley or go to the science lab or any of the support buildings. Scott Base is organized with one long, winding hallway. At one end of this hallway is the Hillary field center where all of the field parties stage before going out to the field. Hillary field center with some of our cargo staged for loading onto helicopters later today. As you work your way down the main hallway you pass lab space, the administration space, the galley, a bar, dorm rooms and bathrooms, and finally another science lab. It’s actually a relatively long walk from one end of base to the other and I feel like I’ve made this trip about a hundred times in the past few days. Breakfast time in the galley at Scott Base. The galley at Scott Base is relatively small, with seating for about 60 people. A cold breakfast is served from 7 to 8 AM, lunch is from noon to 1 PM, and dinner is from 6 to 7 PM. There are also morning and afternoon tea times in the galley. The equivalent mealtimes in McMurdo are typically two hours long, although some food is available 24 hours a day. For each meal at Scott Base there is one main dish, a couple of side dishes, and a dessert. At McMurdo there are 5 or 6 main dishes served at each meal and a very wide assortment of dessert items. Two things that I miss about the McMurdo galley are the 24 hour pizza and the Frost Boy ice cream machine. It can be nice to have a bit of comfort food when you are down here. The dorm rooms at Scott Base are substantially smaller than those in McMurdo. Most of the dorm rooms at Scott Base are setup to house four people in two sets of bunk beds. In McMurdo most of the dorm rooms are setup for two people. When I was in McMurdo in September I was in a four person dorm room that was two to three times as large as my dorm room here, and at that time I only had one roommate. I have three roommates at Scott Base and they are all members of the science project I’m working on. Overall, the space at Scott Base, while smaller is a bit nicer – things are just a bit newer or fresher looking and the base has a more comfortable feel. 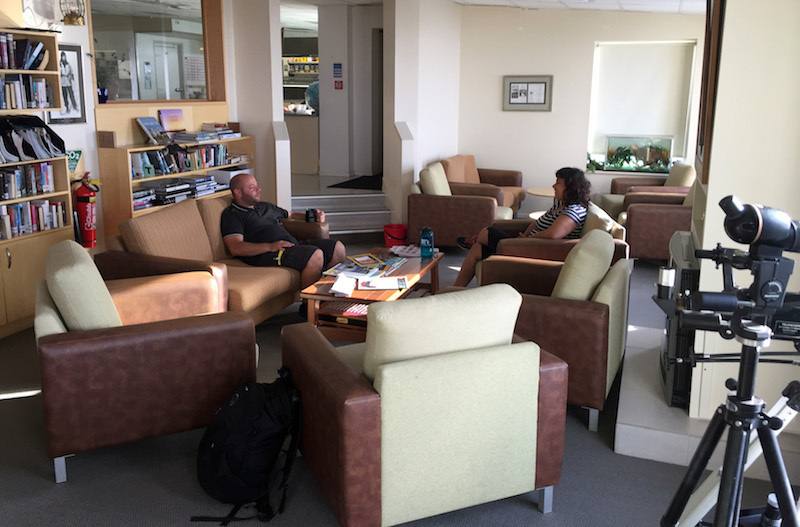 There is a really nice lounge just off of the galley with lots of comfortable seats and a nice view out to the Ross Ice Shelf. Marwan and Raj, two people working on my science project, sitting in the lounge after breakfast. 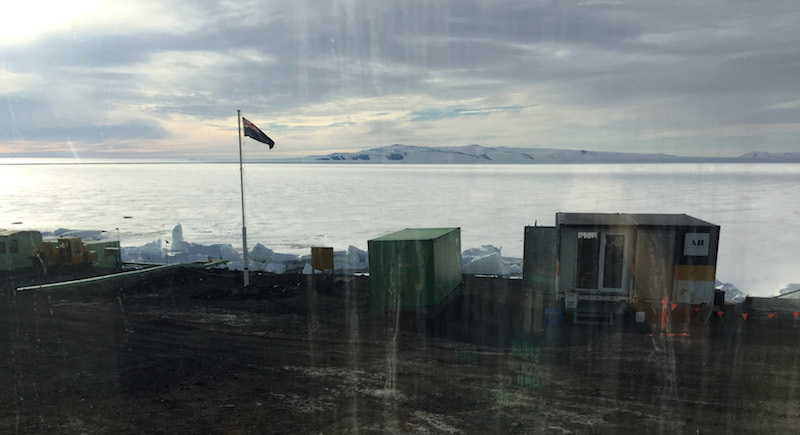 View of White Island and the Ross Ice Shelf through the dusty window from the Scott Base lounge. The two black dots on the ice to the left of the New Zealand flag are Weddell seals. The recreational opportunities at Scott Base are similar to those in McMurdo. There is one bar here while there are three bars in McMurdo. There is a small store at Scott Base that sells souvenirs, some snack foods, and a few essentials like bathroom products. The McMurdo Station store is larger but sells a similar assortment of products. There are several libraries at Scott Base, a small gym and exercise room, and a climbing wall. Outdoor gear including skis, mountain bikes, and fat bikes are available to borrow. I’m hoping that when I get back from my field camp I’ll have time to borrow one of the bikes and take a ride over to McMurdo Station or out on the snow road to the runway. There are several hiking trails in the area if you want to get outside and get a bit of fresh air and exercise and I’m hoping to get out on these trails when I’m back from the field. One thing I was looking forward to seeing on this trip was how similar or different life is at Scott Base compared to that at McMurdo Station. I was expecting a bigger difference than I’ve seen so far. Really the main difference is just the size of the station and community here at Scott Base. No snow at Scott Base?! Nope. This time of year both Scott Base and McMurdo are snow free. There also won’t be any snow in the Dry Valleys at our camp.